Basseterre, St. Kitts, November 3rd, 2017 – St. Kitts and Nevis’ Prime Minister, Dr. the Honourable Timothy Harris, has wrapped up participation in the Toronto Global Forum, where he received plaudits for his passionate speech in support of climate-resilient infrastructure investment. Prime Minister Harris also advocated reconsidering the role of GDP per capita measurements, so that Small Island Developing States (SIDS) are not excluded from concessional sources of funding and development aid. This, Dr. Harris said, is imperative in light of their extreme vulnerability to exogenous shocks like the two recent destructive Category 5 hurricanes, Irma and Maria. The Toronto Global Forum provided the Honourable Prime Minister and his delegation meaningful opportunities to interact with Canadian and international leaders from the public and private sectors between 30 October and 1st November 2017. On the final day of the Forum, Prime Minister Harris took the time to engage with the media including Share News, which brands itself as Canada’s largest weekly ethnic newspaper. 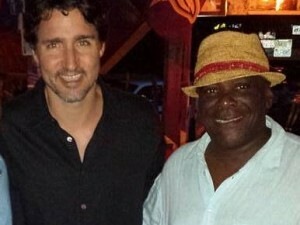 In a wide-ranging interview with journalist Ron Fanfair, Dr. Harris discussed the longstanding relationship between St. Kitts and Nevis and Canada, the importance of global fora like the Toronto Global Forum in advancing St. Kitts and Nevis’ brand and interests, as well as the need for its diplomatic allies such as Canada to continue demonstrating leadership on climate action. Prime Minister Harris also touched on the efforts his Government has taken thus far in reforming and rebranding the Citizenship by Investment programme, thereby making it the platinum standard for the industry. In speaking with the communications team from the International Economic Forum of the Americas, Prime Minister Harris outlined why it was important for St. Kitts and Nevis to be represented at the Forum. The Honourable Prime Minister characterized the Toronto Global Forum as an influential gathering of leaders that encourages sharing perspectives, generating solutions, and developing and expanding strategic networks. The Prime Minister of St. Kitts and Nevis also hailed it as an ideal platform for furthering the Federation’s interests in Canada and beyond. The Federation’s participation in the Forum reflects the Government’s proactive approach in seeking opportunities to raise the profile and expand the footprint of St. Kitts and Nevis on the world stage.